A special jewelry box with contemporary flair for the selective teen is hard to find. Our unique selection of teen jewelry boxes features up to the minute style. Choose the perfect one for your teenage girl from our modern chests, trendy jewelry holders and sleek jewel cases in styles that appeal to tweens and teens. 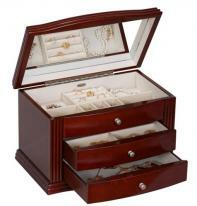 Elegant Mahogany Jewelry Box Chest. Our unique and affordable selection of teen jewelry boxes includes everything from first jewelry chests to contemporary train cases. If you don't see the perfect jewelry box for your teenager, we welcome your call or email. 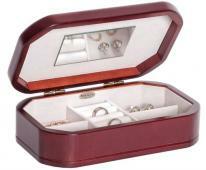 All teen jewelry boxes qualify for easy 30 day returns & 1 year product warranty. As teens begin to build their jewelry collections, they need spaces to keep it all safe and clean. A beautiful jewelry box from Chasing Treasure can be a fabulous gift for a teen, one that will be appreciated for many years as the teen’s collection of jewelry grows. If a teen is given jewelry and does not have any place to store it, then the jewelry pieces will get lost or become damaged. Teens need to learn to take good care of their jewelry, so it is important that they have the proper boxes to keep the pieces safe. At Chasing Treasure, our jewelry boxes come in a wide variety of styles, from young ballerina-style jewelry boxes to handsome pieces that many adults would love to have. When choosing a jewelry box for a teen, it is a good idea to consider the maturity level of the teen and how many pieces of jewelry the teen has. We have curated a collection of jewelry boxes that are made of elegant hardwoods as well as pieces that have been painted. All of them are fully lined with fabrics designed to keep jewelry from getting scratched. Our smaller jewelry boxes are perfect for teens who have some earrings and a few rings. We have other pieces that have spaces for necklaces and larger jewelry items. Some also come with small travel cases for teens who do spend time away from home. Many teens appreciate receiving a jewelry box as soon as they receive their first real piece of jewelry with precious metals and/or gems. 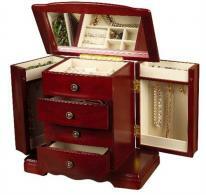 When selecting a jewelry box for a teen, it can be useful to choose a piece that can grow with the teen. For example, many of our smaller pieces have larger pieces that coordinate. This way, as teens get more jewelry, they can ask for larger jewelry boxes and all of their pieces will match. Some of the smaller pieces will fit inside the bigger ones, so they can still use their small earring cases or small ring boxes even after they have moved on to a large furniture-quality jewelry box. Most of the pieces we have curated for teens are rather simple in design. They have clean lines and simple fixtures. We have several pieces in more modern hardwoods like mahogany and walnut, but the majority of the pieces have been painted in flawless finishes. They come in basic colors like white and black, but also in poppy pink, bright orange, or apple green. Some of them also come in faux leather-like finishes, but in bold colors rather than browns and blacks. Selecting a jewelry box for a teen is easy with our curated collection at Chasing Treasure. We have pieces in all price ranges and they all come with the Chasing Treasure return policy and warranty, too. Your favorite teen will appreciate a useful jewelry box for many years to come.